We have to remember that the purpose of reservation is to mould our society into an ideal society where reservation is not required. But with the present reservation system one can never be sure about when to stop it(the reservation system). 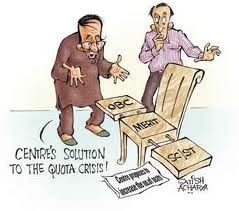 So I have this idea where every SC and ST candidate has the oppurtunity to use the benefits of reservation limited number of times (say two times) and his succesors will not have access to these benefits if he has used all his oppurtunities. If one doesn't use all his oppurtunities, they can be passed on to his successors. In this way every person from backward caste can use the benefits of reservation and at the same time the reservation policy fades away slowly. I strongly feel that this system will help us remove reservation system and at the same time help in uplifting the quality of harijan's life. I am not sure about the practicality of my idea.But I am looking forward to your take on reservation system and your ideas on how to eliminate the necessity of reservation system. P.S. I myself am benefactor of reservation system and therefore I am not speaking out of malice or prejudice towards backward caste people. Thanks for your opinion Paul. Yeah, I haven't seen the loopholes at the implementation level. Thanks for pointing that out. But something has to be done so that reservation doesn't go for 60 more years. Let me tell you what might happen, if that plan(with chance of 0.001 in a million times) is implemented, then as soon as the two chances are over that bill will be forcibly(more like unanimously) taken down, and govt will try to cash that fact for supporting.They point their finger at constitution, while completely forgetting what the person, who wrote it, mentioned about that. What I meant to say is that actions should be taken to gradually decrease the reservation, so increasing the reservation will be defeating the purpose. As Paul pointed out there are some glaring loop-holes in my plan.So some modified bill has to be passed and it should be me made clear that no bill has to be passed which will increase the reservation at any cost.